FORMER Mines deputy minister Freddie Moyo has become the latest politician to be linked to the demise of Hwange Colliery Company Limited (HCCL), a development that left the lives of thousands of families in jeopardy. 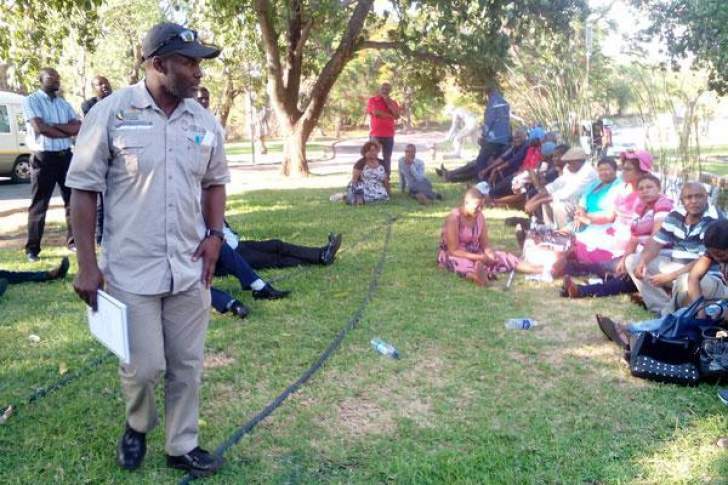 Mines portfolio committee chairman Temba Mliswa addresses MPs and Hwange Colliery workers outside the company offices after administrator Bekithemba Moyo and management refused to be part of the meeting. The government early this month put HCCL under administration, citing the giant coal miner's mounting debts. Mines minister Winston Chitando and one of the colliery's major contractors have since been named by workers as some of the people that played a central role in the collapse of the London Stock Exchange (LSE), Johannesburg Stock Exchange (JSE) and Zimbabwe Stock Exchange (ZSE) listed miner. One Shepherd Tundiya allegedly used President Emmerson Mnangagwa's name to manipulate the HCCL board to make decisions in favour of his company while Chitando, a former chairperson of the colliery, is alleged to have facilitated the political interference. On Friday, the disgruntled HCCL workers added Moyo's name to the list of politicians and other influential people linked to the political elite that are allegedly connected to the problems bedelving the colliery. The former deputy minister, who lost his job after former president Robert Mugabe was toppled in a coup last year, allegedly struck a dodgy deal with the colliery, which saw 30 000 tonnes of coal worth $10 million being lost in Mozambique. HCCL workers' representatives told the Parliamentary Portfolio Committee on Mines led by Temba Mliswa that they were no longer afraid of naming and shaming officials suspected of looting the coal miner, who they feel contributed to its collapse. The workers said most of the individuals who looted Hwange were politicians from Kwekwe. Mnangagwa hails from Kwekwe and Tundiya allegedly used his name to intimidate the HCCL board and management to sign some deals that were detrimental to the coal miner. HCCL workers' representatives had to meet the parliamentary committee outside the colliery premises after the recently appointed administrator Bekithemba Moyo allegedly snubbed the legislators. The company manegement allegedly left their offices in a huff when they heard that the legislators were visiting and there was no one to welcome the MPs. It was not clear whether the administrator had received orders from the top to snub the MPs. Engineering workers' committee vice-chairman Casper Ndlovu said most managers and former ministers that came to Hwange seemed to only have an agenda to loot. He said Moyo's deal where the $10 million worth of coal was lost in Maputo was a tip of the iceberg. "Thirty-thousand tonnes of coal were taken to Mozambique supposedly to look for a customer to buy it, but nothing came out of that coal and the storage space for it was charged for," Ndlovu said. When Mliswa said the workers' committee should name and shame the people responsible for Hwange's demise, chairman Deliverance Moyo said the deputy minister was one of the top culprits. He claimed the former deputy minister was eyeing a coal concession in Hwange even at a time the company was under reconstruction. Ndlovu also narrated a number of alleged corrupt activities that left the colliery in financial doldrums. "A conveyor belt was bought for Hwange Colliery at a cost of $800 000, which was paid, but when the belt came, 400 metres was stolen," he said. "Another manager went to South Africa to buy rollers for the belt. He took a sample with him, but he bought a wrong size. "Another manager went to Turkey alone and bought equipment worth $1,2 million, but when the evaluators looked at the equipment they said it was worth only $800 000. "There was also a spiral plant, which was sold by Hwange for $500 000, but the following year, the same plant was resold for $7 million. "Hwange Colliery Company made an out-of-court settlement and bought back the equipment for $5 million." Deliverance Moyo said the only thing that could save HCCL was to let workers, who are owed thousands of dollars in unpaid salaries, run the company. Meanwhile, former HCCL board chairperson Farai Mutangamira was accused of entering into a deal to buy a spiral plant without going to tender during former Mines minister Walter Chidhakwa's tenure. Chidhakwa also lost his job after Mugabe's ouster last November. Former HCCL managing director Thomas Makore was also alleged to have played a central role in the equipment purchase saga. The workers alleged nearby concessions were allocated to other companies like Liberation Mine, while the Western Concession was given to businessman Billy Rautenbach, yet they were travelling 120 kilometres daily to a concession to mine coal. Deliverance Moyo said there were many other corrupt activities that were allowed to go on for a long time. "When Chitando came, he ordered that every worker must be placed under Cellmed medical aid society," he claimed. "Information we gathered showed that he was chairman of Cellmed. "These people come and run down mines and maybe one of the qualifications for becoming a minister is to run down a mine." The workers said HCCL could save 75% of its costs ($1,30 per tonne) if they refurbished conveyor belts instead of using private transporters. They said despite going for five years without being paid, they were still committed to their work, but were now ready to down tools after the company was placed under administration. Ladocia Mavezere, an ex-employee, said reconstruction would actually render Hwange comatose because it had never worked everywhere it was applied including at companies like Shabanie-Mashaba Mines, Ziscosteel and Air Zimbabwe. Deliverance Moyo said HCCL workers enjoyed a good life and viability of the company was assured during the management of Godfrey Dzinomwa and when Munacho Mutezo was chairperson of the board. They said apart from the good salaries, bonuses and profit-sharing, they were also given food hampers during Dzinomwa's tenure. Hwange Central MP Daniel Molokele said since Anglo American left in the 1980s, the once-vibrant company had deteriorated leaving its skilled workforce destitute, and the town under threat of becoming a ghost town. "I think Hwange town should begin to look for other sources of income, and my vision as MP for the area is to create alternative companies and industries like water-bottling companies, honey-making and mango industry beneficiation," he said. Mliswa said the administrator's behaviour was unbecoming as section 92 of the constitution empowered Parliament to visit troubled state enterprises and parastatals. He said the administrator had actually written to National Assembly speaker Jacob Mudenda trying to block MPs from visiting Hwange to do their investigations. Mudenda reportedly shot down the request, arguing that Parliament was obliged to play its watchdog role over government-owned companies. "We are representatives of the people and we will leave no stone unturned in this," Mliswa said. He said his committee would consider charging the administrator with contempt of Parliament. The Hwange workers are now desperate for Parliament to solve the saga. HCCL has since been suspended from the ZSE, LSE and JSE amid charges that the government did not follow the correct procedures in putting the company under administration.